Childhood is supposed to be full of giggling, tickling, playing and imagining. It should be filled with magic and believing, superheroes and princesses, dinosaurs and barbies. The biggest worry of a child should be about ice cream – a double or triple scoop. However, for 363,000 children in the US, their worries are about injections and iv’s, chemotherapy and side effects. Some are too young to even understand cancer and the prognosis. And all are just far too young to be thinking about going to heaven and fighting for their lives. Cancer affects the entire family and more so when the warrior is young. Instead of skipping and running, wrestling or rough-housing, they are fighting – really fighting this demon, this horrible disease. There are so many programs out there, there are so many things that we should help with, advocate for, spread awareness. However, I can’t think of anything better than to help a child cancer warrior in their battle. 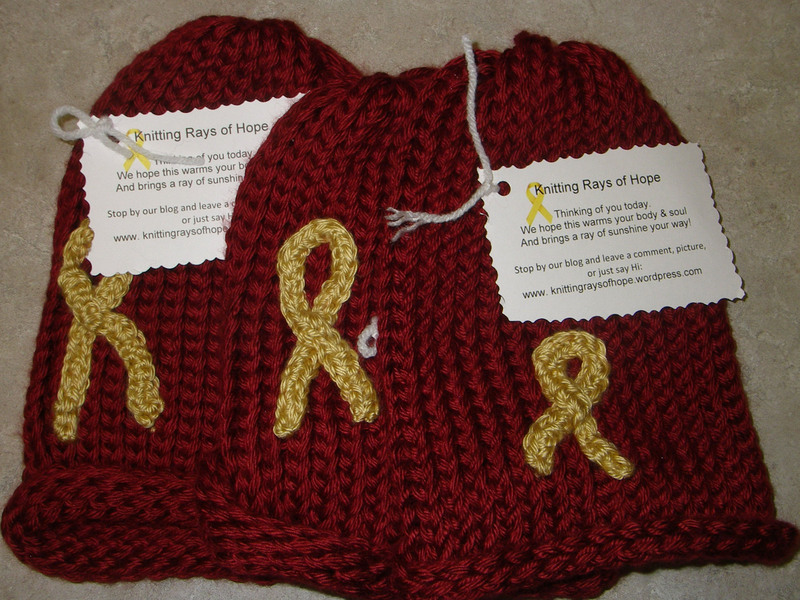 Since the launch of Knitting Rays of Hope, we have been connecting with people who have stories that touch our souls, some break our hearts, causing us to choke on tears, while others are examples of hope and faith. I would like to share this YouTube video that has a poem about A Child Fighting Cancer- Through a Mother’s Eyes (link). It really speaks to us- hope it touches your soul as well.